No matter how many cups you may have in your cupboard, you may have noticed that every time you want to drink your tea you keep reaching for the same tea cup over and over again. This goes to show just how much a certain cup can do for you. 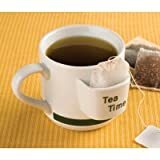 If you are going to buy a tea cup then you want to make sure that you get the best one possible for you. Even though you intend to buy a whole new set of tea cups, you want them to have the very same effect even when serving a first time guest in your home. 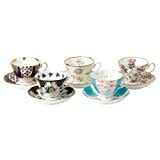 For this reason, the Tea Supply has made sure to collect a wide variety of tea cups of different types and styles so that you are spoilt for choice. No longer do you have to settle for one tea cup just because there was nothing else nice that you could choose. You will be able to choose tea cup sets, ceramic tea cups and even infuser tea mugs. If you want it then we have it in our inventory ready to be delivered to you. All that you have to do is pick and click. Oggi's Fusion double walled sport bottle with it's flip top is adept for storing and carrying water, sport drinks, juice and tea. Lid has removable tea infuser. A lightweight,reusable alternative to disposable bottles. 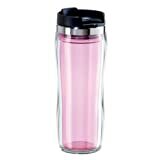 Made from BPA-Free super tough acrylic material. 16-Ounce capacity. Gracie China's Ruffle Collection, by Coastline Imports is adept for service at all parties and tea events. Cup and Saucer, Set of 4, Creamware Fine Porcelain. For your prized tea lover. This ceramic mug keeps the tea bag handy for one more dip at tea time. Holds 10 oz. Sun's Tea(TM) glass is sturdy and durable, designed for everyday use. 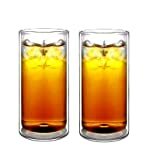 The double wall glasses keep your hot or cold drinks longer due to their unique double-wall feature. Its two walls allow you to hold onto a piping extreme hot glass of hot drinks without burning your fingers, or prevent condensation from forming on the outer wall while holding a cold beverage. This double wall glasses is made of laboratory rate, stronger borosilicate glass. Not like other fragile double wall glasses which is so easy to be broken, this one is very solid and durable, it is perfect for your everyday use. La Rochere’s “Napoleon Bee” Beer Glasses are sturdy and excellent for everyday use. Classic in design, our timeless beer glasses are both casual and elegant and will compliment any table, tasteful and charming glassware for serving beer, water, wine, juice or Iced Tea. La Rochere drinkware has a stable base and is easy to hold making it splendid for family and guests. Easy to clean our glassware is dishwasher safe. Steeped in tradition La Rochere is the oldest working art glassworks factory in France. La Rochere’s pieces are fired at a very high temperatures producing an exceptional quality glass that is both crystal clear and durable. A pressure seam is sometimes visible, which is the mark left by opening the mould in which the glass is pressed. It is the characteristic of pressed machine glass and symbolizes its heritage and makes each item a true piece of French glass history. 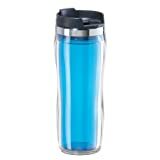 Oggi's Fusion double walled sport bottle with it's flip top is excellent for storing and carrying water, sport drinks, juice and tea. Lid has removable tea infuser. A lightweight,reusable alternative to disposable bottles. Made from BPA-Free super tough acrylic material. 16-Ounce capacity. 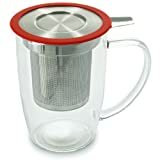 NewLeaf Tall Tea Mug is designed for simple and clean way of brewing just one fresh cup of tea. It also enable you to enjoy the color of your popular tea! Glass mug holds up to 16-Ounce. Royal Doulton announces the international launch of the 100 Years of Royal Albert collection, celebrating a century of English craftsmanship through ten patterns representing design trends of each decade of the 20th century. Royal Albert’s success dates back to the late 1800’s, and the new collection celebrates the brand’s vitality, longevity and rich design history. The collection features all bone china with 22 karat gold accents on teacups, saucers, plates, mugs, teapots, creamers, sugar bowls and figurines. Every pattern included in the collection captures the true historical design statements and trends of each time period. Featuring Royal Albert brand signature delicate florals in many of the patterns, all items from the 100 Years of Royal Albert collection are packaged in unique deep pink and burgundy Royal Albert hatboxes with illustrations of all ten patterns. Oggi's Fusion double walled sport bottle with it's flip top is perfect for storing and carrying water, sport drinks, juice and tea. Lid has removable tea infuser. A lightweight,reusable alternative to disposable bottles. Made from BPA-Free super tough acrylic material. 16-Ounce capacity. Fistsicup Knickleduster Coffee Mug For a Knockout Cup of Coffee! 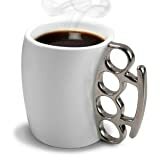 This man-size coffee mug packs a serious punch! Just like Brass Knuckles!! Do you take your morning brew light and sweet, or are you a hard hitting black coffee type? Either way, you'll get a fistful of your esteemed beverage with this smashing new mug. Sleek ivory high-fire ceramic contrasts dramatically with the steely metallic handle. Consider it "protection" from whatever your day decides to dole out. Ceramic mug. Metallic handle. Hand wash do not microwave.